For some the dreaded back to school time is happening and soon! I’m so glad they don’t go back to school here until September. However no matter when you kid’s go back we all know there’s always so much to get for the start of school, shopping and more shopping. If you have a child headed off to college, I have the perfect giveaway for you! 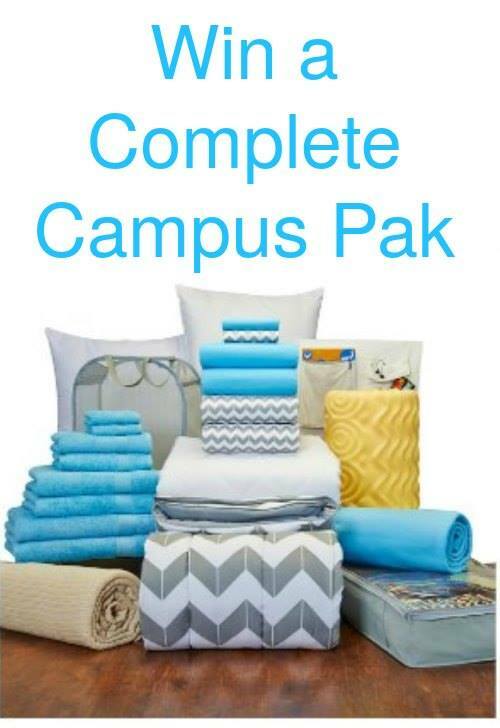 But, before you enter, be sure to check out these Dorm Room Essentials along with the Printable Checklist! It is bound to make prepping a bit easier for you and your college bound student. And the winner can choose their color of choice from what is available! Now go and enter on the giveaway below and good luck! Don’t forget we also have lots of other fabulous giveaways running right now. You can see all the giveaways on the right hand side of our page under Current Giveaways. Make sure to snag our FREE Recipe book Simply Sweet Desserts HERE. As a girl who went to college, I know I saw some gnarly things happening on mattresses. I did see a mattress pad, but oh my word the things that happen on those beds. A plastic encased mattress cover (or just your own mattress) would be SO ideal. I would add sanitizing wipes…germs and messes are everywhere at school. I would add organic not gmo snacks. My favorite is the Pop-open hamper, the ones with the handles are so handy when you have to walk to the laundry! Love them all, I would choose the laptop and printer which is a must for any student. Bring a pair of flip flops to use in the shower. Definitely the laptop and printer are very important. Alarm clock with back up power for extra…. I would most like to have the mini-fridge and under-the-bed storage containers. That looks like a wonderful checklist so that you remember everything that you need. I think I would add snacks like protein bars. Something I didn’t see that is super important is extra printer cartridges. I make sure my son has 4 blacks and 2 of each color. I would definitely say the mini fridge. When I was in college, we had a LOT of all-night tudy sessions. Having food definitely helps. I’d add flip flops or shower shoes. Chances are they won’t have a private shower in their room so they’ll have to walk back and forth and may not want to put shoes on damp feet and depending on the dorm and the OCD level of your student, they might actually want to shower wearing them. Athletes foot goes around. i really like the whole thing,but i know accidents happen a lot, first aid kit would be great and a giftcard of course. This is a great list. I would say the egg crate pad is essential. The pop-open hamper is my favorite. The pop open hamper is a good idea. It takes up less space than a laundry basket and is easily carried to the laundry room (or home). First aid kit, not just band aids. A gift card to local store that can be reloaded. I just love this checklist! Thanks for sharing! def the under the bed storage boxes. I would add a memory foam pad. It is a nice list. I would add more towels and a first aid kit. I’d also add a pantry goodies box. With easy stuff to snack on like peanut butter, crackers, bags of popcorn, cereals and of course candies. It would be nice if a person giving the gift would go to a couple of restaurants in the area & buy a gift card for them. Every student loves a free meal. Pain reliever is my favorite, who can do homework with a blinding headache! Hamper is fine but, a roller one with double capacity would be awesome. I would add queen sized bedsheets and a television set. I’d also have more bath towels. I would add first aid kit. Printer is definitely something I need. Great checklist! The cork board to record your schedule is my favorite idea on the list! That is a great idea! Thank you! I love the color black with grape vines. I would add a gift card for something they may need, and did not think about. I like the pack in Black Hampton Plaid! Loved the checklist too! I’d don’t think I’d be able to live without a coffee maker! Thanks so much for the chance! I always need corkboards and whiteboards to keep track of schedules, to-do lists, and more and think they are definitely a staple when it comes to school! I love that the packs cover most of the needs!!! A throw rug & table lamp are great ideas! I like the sheet set and the comforter. Also like the checklist and to make sure roommates do not bring tv’s, fridges, coffee makers because you only need one for the room. I would love the twin bedding set in grey and white color. It would look nice on my son’s bed. This is a wonderful giveaway! I like that the packs have so many essentials. I think a throw rug is a great idea too!